To be perfectly honest the dumb cover text doesn’t do the film justice at all. Really, this nice B-movie turned out to be way better than expected (although – truth be told – it can’t be called ‘good’ by any means). NINJA’S FORCE is just about nine seconds old when a Ninja kills a guard from his hiding place. Ten seconds later another one gets a knife thrown deeply into his neck. Not a bad start for a film if you ask me. The mysterious Ninja enters the house and sneaks through the rooms. He is dressed totally in black, with the exception of a red headband that somehow destroys his invisibility. The killer enters a room, kills the professor in it and takes some important documents. Suddenly the professor’s daughter can be heard calling her father’s name. The girl, who is confined to a wheelchair, opens the door… and the sharp sword of the Ninja wipes out her young life. Blood splatters on the wall, the picture turns red, and the opening credits appear on the screen, accompanied by a famous music tune (I can’t figure out from which film this music piece is taken though). Next we are witnessing an important meeting and guess what the outcome of it is!? ‘We need a Ninja!’ And where do we get one? ‘From Japan of course!’ Because the existence of mankind is at stake (now that’s a surprise, isn’t it? ), two guys go to Japan in order to find a Ninja, and one of them comes back with Kenzo (his companion didn’t survive the mission). ‘Funny. He hasn’t got a black dress. And he doesn’t look Japanese.’ These are the comments of two girls after seeing Kenzo for the first time. Actually they aren’t so wrong. Kenzo is a rather calm, inconspicious but handsome young man and he doesn’t look at all like an unstoppable killing machine at first glance. But Kenzo is an unstoppable killing machine and his piercing eyes seem to see through everything (and everyone). Besides he’s very good to disguise himself (for example as a harmless fisherman) and he is able to sniff explosives! That comes very handy when some dynamite is hidden in the car and he notices it a few seconds before the car explodes. The bad guys in NINJA’S FORCE are a certain Mr. Duncan and his Ninja scientist who kidnap young girls and perform bizarre experiments on them. Their aim is to totally control their minds, make them their slaves and turn them into merciless killers. While the experiments certainly are horrible the way they are presented on screen makes them appear unintentionally funny. For about an hour NINJA’S FORCE is an average B-movie, rather slowly paced, unspectacular, a bit unusal but not uninteresting, with relatively little action and acceptable performances of the cast, but it still is somehow entertaining and not boring at all. It’s just average in all departments and there not really are memorable highlights or thrilling fight scenes. But then, everything is changing. Because in the last third NINJA’S FORCE delivers nearly all you come to expect from Ninja flicks. The (until now) average movie becomes almost great and entertains us with cool Ninja action right up till the very end. Kenzo kills himself through the lines of the criminals, although it has to be said that a lot of it takes place at night and it’s so dark it’s hard to see what exactly is going on. Kenzo knows no mercy, as he cuts off an arm, decapitates a man, slashes a few others with his sword, cuts throats and throws knives in the foreheads of gangsters. While this isn’t overly gory it still comes around as very brutal and is a joy to watch. The ultimate showdown between the two Ninjas on the beach is pretty short but I think it rounds up the flick quite nicely. I have no idea if the German tape release is uncut, but from what I’ve heard it’s longer and has a better quality than the recent DVD release. 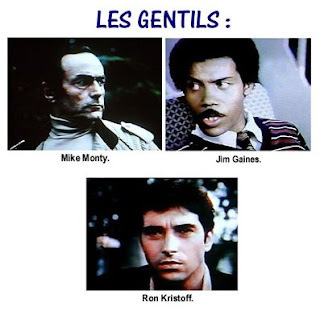 The star of the film, Romano Kristoff, entered the film business in the early 1980s with small roles in movies such as L’ULTIMO CACCIATORE (THE LAST HUNTER, 1980) and TORNADO (THE LAST BLOOD, 1983), both directed by Antonio Margheriti. 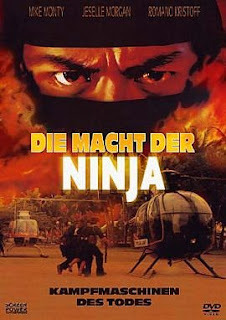 After taking part in BRUCE’S FISTS OF VENGEANCE (1984) and WARBUS (1985) he appeared in three Ninja flicks, namely NINJA WARRIORS (1985), DOUBLE EDGE (1986 – this movie is called DIE MACHT DER NINJA 2 in Germany, passing it off as a sequel to NINJA’S FORCE), plus of course the one under review, which he not only co-directed but also co-scripted (together with Ken Watanabe). 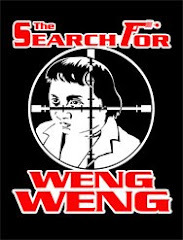 Other credits include THREE MEN ON FIRE (1986, also screenplay), JUNGLE RATS (1987), DOG TAGS (1990), ANGEL IN THE DARK (1991), DANGEROUS PASSIONS (1998) and DOOMSDAYER (2000). Ken Watanabe should be no stranger to Ninja movie fans also, as he appeared in NINJA WARRIORS (1985), NINE DEATHS OF THE NINJA (1985), and DOUBLE EDGE (1986). Besides, he can be seen in BRUCE’S FISTS OF VENGEANCE (1984), COMMANDO INVASION (1986), and in a few parts of the RAGAZZO DAL KIMONO D’ORO (KARATE WARRIOR) series. 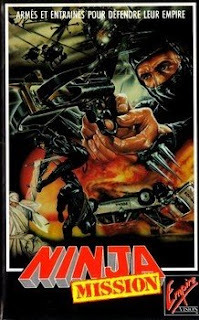 Although not a great film by any means I really enjoyed NINJA’S FORCE despite its shortcomings. Ninja flick fans will probably lap up the cool finale, and B-movie fans should have fun with the whole eighty-seven minutes. I usually wanted to give the film seven points for entertainment, but because of the fact that the finale turned out so well I have to give – for the first time ever – a komma rating. Just in case you’re wondering. where can i find a copy of this on dvd or vhs ?